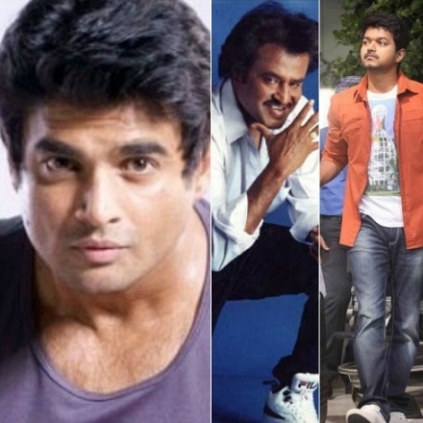 Actor Madhavan talks about Rajinikanth, Vijay, Kamal Haasan in an extensive Facebook chat session with his fans! Madhavan (Maddy), who is considered to be the evergreen lover boy by thousands of his girl fans, took some time out to get in touch with his Facebook followers. In an extensive chat session, he shared some honest, straight from the heart responses to some of the questions that were thrown upon him by his fans. 2. Will you act as a villain against Ajith? Will do any role against anybody as long as it's an awesome script. 3. Will you do a negative role like Siddharth Abhimanyu played by Arvind Swami? That role was offered to me. Glad Arvind did it... Awesome actor. He is an awesome guy and we are close family friends. 5. Who is your favorite music director? It has to be A R Rahman. 6. Unforgettable moments in your career? When I met Kamal sir. Mani sir. AMITJI ... And Rajini sir. 7. What type of films do you look forward to act in? I am dying to do an out and out comedy. Let me know if someone has a script? 8. About Irudhi Suttru ? It's getting slightly delayed as it's in 2 languages and we are waiting for the tech aspects to be completed. 9. On your new look? We worked a lot on the new look, trust me it will shock you. I like the current look as opposed to the chocolate boy look. 10. Will you act in a romantic film like Alaipayuthey? It’s very tough .. I am 45 and cannot look like a young lover boy any more... Ha ha ha. 11. Which movie makes you proud for being a part of it? Why? I am very proud of Three Idiots. 12. Why did you reject, The Man Who Knew Infinity ? I was too old and my market did not make it feasible to make a 10 million dollar film. 13. Why don’t you act in movies often? It takes a long time to find a script that I am super passionate about.. I have lost interest in doing back to back films for money... Although I do charge pretty gravely for my movies. 14. When can we expect Anbe Sivam kind of movies from you? Wish more people had seen it in the theaters when the film released. 15. If not an actor, which career would you pursue? 16. Whose biopic you would choose to act in? 17. Is it true that you auditioned for Iruvar? Yes it is true ... I remember the dialogues even today. 18. Who is one Tamil actor you've always wanted to work alongside? 19. One word about Pawan Kalyan? 20. What's your opinion on Goundamani and Rajinikanth? Madhavan's To Come Along With Aamir Khan's PK ! The Dubbing Rights Of Vijay's Puli In Hindi Is Apparently Bought By Censor Board Chief Pahlaj Nihalani. People looking for online information on Ajith, Kamal Haasan, Madhavan, Vijay will find this news story useful.